What are some of the best sellers in compound bow Packages – For Youth? We’d like to help make it easier for you, when trying to find the perfect compound bow for beginners so that you don’t waste any money. That is why we have put together a list of our 5 most highly recommended compound bows packages for youth that we recommend for you to choose from. Ok, so you’re interested in getting involved into archery, great! We are here to help you! 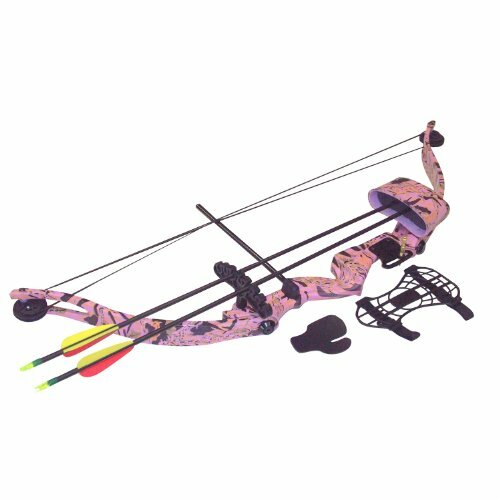 We are going to start off our list with #5 SA Sports youth majestic recurve compound bow set. 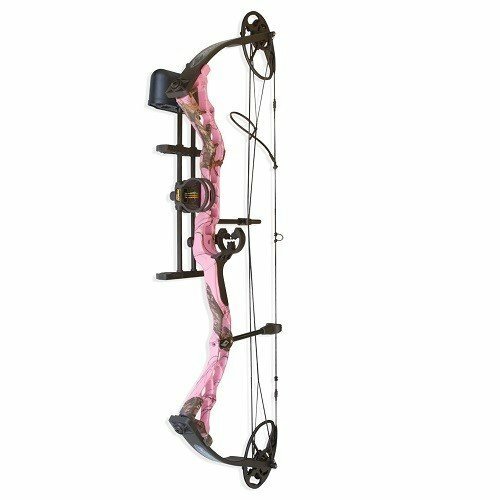 The Majestic Recurve Compound bow is specifically designed for girls, as you can tell pretty in pink! Of course, this is one of my favorite colors as you can tell. 🙂 Enough about the color lets talk about the performance and it’s features. SA Sports Youth Majestic Recurve Compound Bow isn’t meant for hunting this is more for taking to the range to practice with, this is a great introductory bow who is interested in archery. 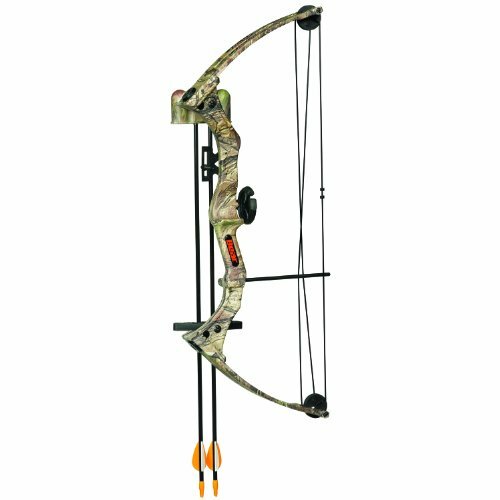 Features: Majestic Recurve includes, the full size integrated a quiver, sight bracket, adjustable brass sight pin, replaceable arrow rest, finger tab and arm guard. Dipped camo finish. The Bear Archery Brave 3 right hand Bow Set is a great starter for any young beginner who are eight years old and up, depending on experience in shooting, this bow is not a toy never leave a child unattended. Built with quality and passion for archery and a fantastic price to boot. The Brave Bow Set includes everything that a young archer will need to get started in archery. two safety glasses ™ arrows offer high flexing quality leaving your hands splinter-free, armguard, two-piece arrow quiver, Whisker Biscuit Arrow Rest®, pin sight, and we can’t forget the tempory tattoo as an added bonus. The Diamond Atomic Package for youth is a great bow for ages 8 & up, comes with everything that a young archer will need to get started in archery. Wide range of adjustments that will fit your child for many years to come. What all comes with the Diamond Atomic Package? Includes; 3 arrows, 4 Mathews lite harmonic stabilizers, CNC cut for 80% less wind resistance, the arrows are black with blue and white fletching, although If you did consider purchasing the Diamond Atomic Package for Youth I’d also recommend heading over to an archery shop to get the arrows cut to the correct length for your child’s draw, as well replacing the tips with a proper 65 grain field points. Some customers have voiced that the arrows seem to be a cheaper carbon arrow. However, the quality of the bow for under $200 that includes about a $20 worth of carbon arrows, the quality alone on the Diamond Atomic Package makes it worth the purchase. The Genesis Original Bow is combined “zero let-off” with light draw weights that cover all standard draw lengths, this bow is meant to fit everyone. With the Genesis it is ideal for a kid to start off with because they can grow into it and not outgrow it, as there is no specific draw length requirement. Easy to shoot, simply because the draw length is always right. This is great bow to start off with even for the whole family to enjoy shooting, genesis is the official bow of the National Archery that is found in school programs this is the only model that is allowed in their competitions. Note: this is a left handed bow that is drawn back to the left hand, Not to be held in the Left Hand, this is held in the right hand. The great thing about the genesis is it’s vice-versa for the right handed bow. Genesis is great for any beginner whether you are just taking the genesis out to the range to practice with, this is not meant for hunting since you need at least a 35lb bow to hunt with, some user’s have used the genesis for shooting small game with the right razor tips. However, I wouldn’t recommend hunting with the Genesis Original bow as “it’s simply not strong enough”. If you’re looking for something for the whole family to appreciate as a starter bow then this is a great buy for the whole family to use, if you have a youngster who is around 4 years old that is interested in learning archery I would recommend starting him or her off with the genesis mini bow. If your child isn’t a beginner & has already had some lessons and his/her pull is stronger you may want to consider the genesis pro model giving you the option for a higher draw weight, adding easily a removable and has an adjustable stop, meaning for ( draw length ). 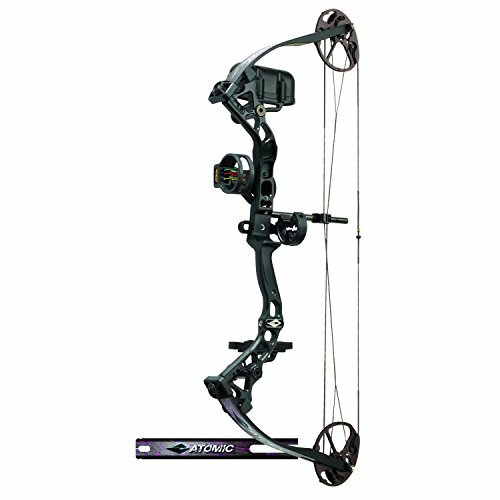 The Genesis Original Bow is all around a great bow for the whole family to enjoy as an introductory bow at a great price. This is a great buy even for a grown adult, of course if you’re not a pink fan it also comes in Mossy Oak or Black Ops Packages to choose from. Infinite is a great compound bow for smaller framed hunters, whether you are a beginner or a pro! This bow is completely awesome with an adjustable draw length/weight very lightweight, this bow packs a punch right out of the box & is designed ready to hunt, although you will need to make a few adjustments to the weight to shoot dead on. It comes with everything attached as shown in image, sight, rest, quiver, warranty. It does not come with Arrows you will need to purchase those as well when placing your order, recommended arrows Custom Carbon arrows or BloodSport Archery Women’s Athena 25-55# Arrows with Field Points. The Diamond is recommended for ages 9 yrs and up, this is an excellent bow that grows with you as a beginner archer, the right-hand bow is held with your left hand and the string release is with your right hand. When choosing a bow you should always choose based on your dominant eye, not sure which one is your dominant eye you can find out by clicking How to find out your eye dominance. If you have any question or comments on the Best Sellers In Compound Bows Packages – For Youth, Or if you have an experience with any listed above, you’d like to share, we’d love to hear all about it below.